It’s that time of year when most of us contemplate on what we want to achieve in the coming year. We take a stock of our life and decide what we would like to change. We make ‘resolutions’. Unfortunately, most of us don’t keep them up for very long. There are many reasons why this could be the case. I often see people setting goals they ‘think’ they want to achieve, based on what others are doing. Or based on what they think they’should’ be doing. For many years, I had these kinds of goals and was never really successful in achieving them. First, because they were not based on who I am at the core. Second, because I was not deeply motivated by the goals, but more coerced into them. I fell prey to the belief that in order to achieve this, I had to do that. Which is rarely the case. There is more than one road to a certain destination and there are many destinations to choose from. I was always trying to achieve my goals by going against my nature, instead of starting from where I was and what I had to work with. In the end, the resistance was always greater than the will and I ended up giving up. Now, I’m getting smarter (although sometimes I still try to squeeze myself into a mold that doesn’t fit, I recognize it much faster than before). I acknowledge and appreciate who I am as a whole and develop a plan that creates the least resistance. I make small changes that fit my life. I am much gentler with myself and forgive myself for my shortcomings. I focus on my strengths (even if they may seem like faults for others) instead of trying to change my weaknesses. I don’t negate my needs and I contemplate where they come from. I soothe my fears instead of repressing or fighting them. When I started taking this approach, everything became much easier. Not always easy, but easier. The best thing I did for myself was to stop judging myself. I can’t even begin to tell you how much this change of attitude helped to shift my life. Emotional healing: I work on myself on a regular basis. There are many modalities that can be helpful to manage your emotions. Some people find tapping really good. I recommend the book ‘Feelings buried alive never die’. Some people might need to work with someone like me to help them get out of the deeper water before they can work on themselves. In any case, find a way to help you heal & manage your emotions. 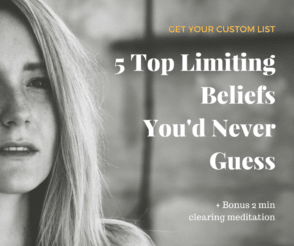 Limiting belief work: similar to emotional healing, it is very important to shift limiting beliefs in order to shift your life. I teach how to do this work in a monthly workshop on ‘Discovering and clearing beliefs’. There is also a few lists available as virtual workshops. Flower essences and essential oils: When fear and anxiety creep up, I use the flower essence of Olive and a blend of essential oils to calm my system down. You may need to find the one that works best for you. Because the root of our fears and stress is different from one another, finding what works for you is crucial. You may need to try a few different ones before finding one that works, so don’t give up too early on these powerful supportive frequencies. I also find the flower essence brand of Botanical Alchemy and Young Living essential oils to be very effective. Gemstones: When you connect with a stone you can have access to different frequencies that will help to achieve your goal. These work in a subtle but powerful way. Every crystal and gemstone have their own unique properties that interact differently with each person. Finding the stone that would be most beneficial for you is important. Don’t restrict yourself to the description ascribed to the stone. In my store, I help people select their stones based on their energy field (not based on what the gemstone is meant for). Affirmations: I was never big on affirmations before. However, I started working with them more regularly lately and have noticed many positive changes. I do believe strongly that you should first heal the root cause of the unwanted experiences. Affirmations only help overcoat and strengthen a conscious desire. They don’t transform the source of negative attraction. Support team: Your environment has a lot of effect on you and your life. You want to make sure you surround yourself with people who believe in you. If your friends and family are not able to cheer you on and provide unbiased support, it may be best not to include them in your plans.